With costs jumping to an all-time high, saving money has been becoming more and more of a priority, more than it ever was. So anyway to cut on costs is always good. No matter what the weather is like in your location, whether you are in the sunny states or the cold winter areas, you can save a good bit of dough through garage door insulation. Getting your garage door insulated is a way to save you hundreds of dollars every year on your energy bill at home! This is one investment that will certainly pay off in the end! You will get your money’s worth and more! Is Insulting my garage door worth the investment? Now just be sure you understand, that just because you insulate a garage door, doesn’t mean that it will immediately be hotter inside the garage. It will help the garage door to retain what heat is already inside, not make it warmer on its own. So if you are using your garage as additional space for your home, and you do not open it on a regular basis, then this would be a perfect investment for you to keep the extra space warm. The catch is that every time you open your garage door, you are letting out all the warm air and letting in the cold air if you are in a cooler temperature area. So you will need to find a way to keep the heat in if you plan to open the garage door regularly. 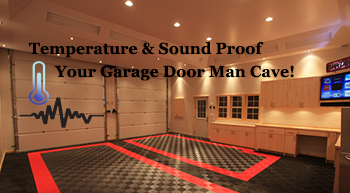 Make your garage into a man cave! Does your husband complain about needing some space for himself, or maybe you just want some space from him from time to time? Then maybe transforming your garage into a man cave would be the perfect fix for you. It is fairly easy to create a living area with your garage as long as you insulate the garage door, the walls, and the ceiling. This can be a pricey project, depending on the size of your garage door. It can cost somewhere around $1,500 for your insulation, but if this will be a place you will be spending a good amount of time in, you will want to keep it warm. You could also just buy an insulated garage door brand new, but that is actually double the cost of simply insulating the garage door you already have. This is a good option, though, if you are looking for a higher amount of warmth for your garage door. The choice is up to you on how you insulate. Protect your garage in all weather conditions! 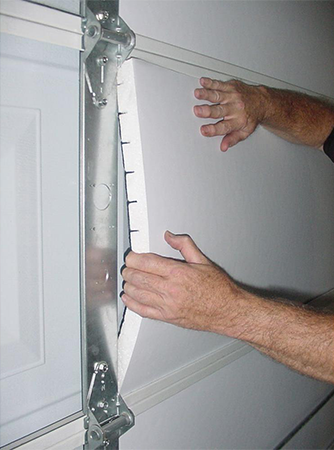 Going along with insulating a garage door, it is also a good idea to ensure that the door is sealed properly. One way to do that is through the installation of weather stripping, so the door makes contact with the ground and the seal is airtight, using the foam to seal any gaps. This is an inexpensive way to keep your garage protected as it can cost as little as $100. This can help to lower the drafts that come into your garage, more so for the colder climate areas. Just like in life, every little step counts, just like every little bit of insulation counts. Think about those temperatures of 20 and below and then ask why you want insulation for your garage door again. We hope these tips help keep you warmer in the cold weather! If you are looking for an expert to work on your garage door then look no further than Clark’s Garage Door & Gate Repair. We can service any garage door need you have, whether it is garage door insulation, garage door repair, or any other service, we are the company for you! Give us a call at (877) 622-8183 today for a free quote!